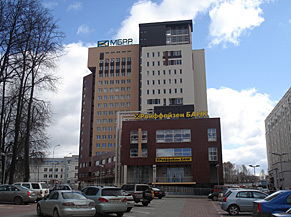 The Business Center «Stolitca Nizhniy» was put into service in 2005. The building is situated on the crossing of Reshetnikovsky boulevard and Granitny lane, and faces Maksim Gorkiy Street — one of the main streets of Nizhniy Novgorod. That part of the city is traditionally considered to be the central business district, where a great number of prosperous companies’ offices are concentrated. The business centre is located in 5 minutes’ ride from the Kremlin, 3 minutes’ ride from Gorky Square and Svoboda Square. The building contains a group of towers different in size and colour. The business centre is projected as a conglomeration of skyscrapers with a pedestal uniting the whole composition. This project is the first specialized business centre of ‘A’ class in Nizhny Novgorod. Office areas cover more than 22 000 sq. m. This is a high-class building with the wide choice of options. The significant number of banks, insurance and consulting companies rent offices in the business centre. Such companies as Raiffeisenbank, Moscow bank of modernization and development, Paribas Bank, Forus Bank, Banque Societe Generale Vostok, SberBank, Alliance Rosno, Le Grand, etc. are among them. The business centre is supposed to be the first specially constructed building of such a type providing its tenants with advanced conditions that makes it one of the most attractive objects of commercial real estate in Nizhniy Novgorod. High-quality materials and the newest architecture technologies are used in exterior and interior trimming and decoration. Modern strict style will accentuate business image of the tenants; plenty of daylight and effective free layout are able to create pleasant working atmosphere. The building is distinguished by the foremost engineering, including soft-running high-speed German lifts, central ventilation and conditioning system, modern firefighting system, fiber-optic communication link, security and access monitoring system, twenty-four-hour guarding, and the large underground and surface parking. The business centre infrastructure is rather developed as well. The presence of the fast-food restaurant «Edok», the Wine Boutique, the self-service drug-store, the beauty salon, the flower shop among the tenants of the business centre «Stolitza Nizhniy» allows to organize a working day efficiently.